Filtrex s.r.l. was founded on March 30th 1977 by Mr. Luigi Riolo with the goal to produce and commercialize filters for the industrial and power generation sectors. Since 1977 Filtrex has made substantial research and developments in the field of filtration, showing its innovative approach and focus on the different requirements of the world market, and achieving constant growth. 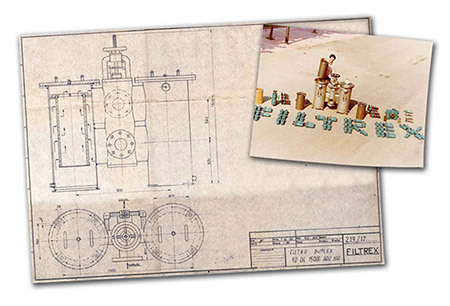 In 1982 Filtrex started the production of selfcleaning automatic filters for the Italian Navy. The growth of both the Industrial and Naval markets led to the construction of a new manufacturing and fabrication plant. Filtrex’s innovative and unique filtration technology finds a large application in the hydrocarbons processes of the petroleum refineries and petrochemical plants. In 1986 Filtrex provided their first self cleaning, skid mounted ACR filter to one of the most important Eastern Europe refineries. In the following years this market was gradually expanded with Filtrex becoming one of the main suppliers to the Oil & Gas industry. Filtrex has also applied its innovating filtration technology to the Marine market, starting a cooperation with the main shipyards in Korea, Cina and Japan for Heavy Fuel and Lube Oil filtration. Thanks to the great performance of its filters and the excellent feedbacks from end users, Filtrex products have been homologated by the major Diesel Engine manufacturers all over the world. To provide proper support to customers and ensure their satisfaction, Filtrex has opened branch offices in key countries such as USA, India, Korea and Japan. Since the year 2000, the main licensors of refinery processes have shown their interest in Filtrex’s filtration technology, in particular its ACR filter. Filtrex has formed long term collaboration with such licensors, becoming a trusted partner and a preferred, recommended supplier. Filtrex has always continued to invest in R&D and new production capacity. In 2009 Filtrex moved the entire production in its new larger manufacturing plant which has new advanced highly automated systems such as CNC machines and Robots. In 2010 Filtrex moved all the offices to a new Headquarter in Milan in Via Rubattino 94/B, demonstrating its faith in the market recovery from a difficult, worldwide crisis. In order to meet the needs of water and seawater filtration, Filtrex has also developed and successfully commercialized the ACB automatic filters. Several tests have been successfully performed together with the customers in independent laboratories/testing facilities witnessed by the major Certification Authority. Today the ACB filters are the preferred choice of sea water filtration on ship. Filtrex believes that the key to growth and success is its research and developments and its commitment to supply state of the art products.